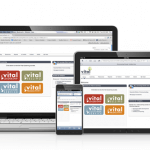 Vital Learning’s new online courses are separated into short modules by topic. Each module takes about 7-10 minutes to complete. This creates a highly effective and high flexible online learning solution that is designed for how today’s leaders want to receive information. The module format enables participants to better retain and easily review each topic. It also enables organizations to create tailored learning strategies to address specific team needs. 2. Optimized for every device. The new online management classes are built in fully responsive HTML5. What that means for users is that they will have an excellent experience with the course on any device. A participant could take the first module of the course on her phone during the bus ride to work. She could take the second module on her iPad that in the field. And she could take another module back at her desk on her laptop. All progress and scores are automatically saved and synced across all devices for a truly seamless learning experience. Our objective is for the design to be easy to use and intuitive so the learner can focus on what’s important — the content. The refreshed courses have been designed to best meet the needs of today’s leaders and managers. The overall focus is learning by doing, creating an engaging environment where participants continually practice and build their confidence with the concepts and Skill Points over time. Short scenarios and interactive exercises prepare students for the skill development sections where participants apply the Skill Points in practice situations. 4. Highly interactive, visual, and engaging. “A graphic is worth 1,000 words. 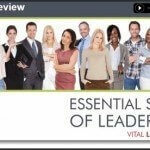 A video is worth 10,000 words.” The new courses utilize graphics, unique exercises and videos to make the course highly interactive and engaging. We’ve shot 160 new high-definition videos for the new courses. These include Positive Model videos (Office, Industrial, and Healthcare versions), as well as short video-based scenarios. 5. Skill development over time. 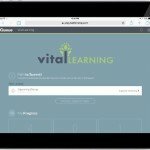 All of the new management online courses will include free access to our new Vital Learning reinforcement mobile app. The app will enable participants to continually develop and practice their skills over time (for a few months after the initial classroom training). This reinforcement is an easy and engaging way to help participants become more comfortable applying their new skills back on the job. 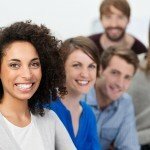 Are you providing your attendees with a “Certificate of Achievement”? This is available in a Word format that allows you to add the attendee’s name. The Certificate of Achievement can be found in the facilitator guide on the Resource CD or on the Vital Hub. For eLearning users they can print out the Certificate of Achievement from the LMS. 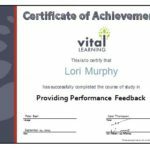 The Certificate of Achievement is available for all Vital Learning courses. Be sure to provide this valuable resource to all your attendees and make a Vital difference. 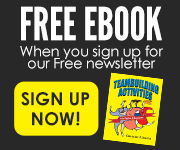 You can choose to purchase workbooks to accompany each course. Digital or printed versions are available. Click here for purchasing information.